Well it has been sometime that I didn’t cover any Custom ROM’s for Galaxy Ace. So here I go with a list of Present Custom ROM’s some of which are still receiving constant updates. You can use any of them depending on your Choice of the Base i.e Stock, Cynogenmod 7.2, Cynogenmod 9 or CynogenMod 10. Only follow the Steps using the files given here. Do not use older ROMs from previous Tutorials. Before Installing Custom ROM you will need to install ClockWorkMod 5.0.2.6. Assuming that you have already copied the custom ROM on your SD card and you have CWM 5.0.2.6 Installed. So now lets have a look on the Custom ROMs for Galaxy ACE. It’s stock based, one of the most beautiful ROM I have ever used. Rest all things are neat and fast. You can definitely give this a try if you are a die hard HTC Sense interface lover. One thing I noticed about the battery is that it will turn red as soon as you connect the charger, do not worry it wont effect anything. Download the ROM from XDA thread. Platlogo Image and Text Changed, WP7 Font. 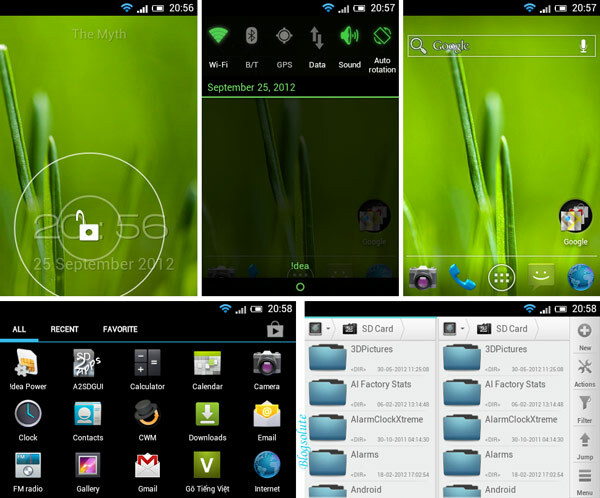 CynogenMod based and themed with ICS + Xperia elements. To mention specifically, you will love the boot animation of Droid ACE. Additionally you have ICS Layouts as optional visual style. You can Overclock your Galaxy ACE with this ROM as it has a OC Kernel. Rest specific instructions can be found on XDA. Fully Xperia S themed stock based Custom ROM. It is stable and fast. I had problems with the 13th version, it had no status bar. The developer has promised to fix it in next release. Hence if you are downloading the 13th version you can use free status bar app from market to solve the problem. Search Notification toggles in Market. This is one of the most simple and stable Custom ROM Based on Stock. I have personally used it for long time. The best thing about Myth Team is that they roll out regular updates. Additionally you can get other stuffs via the Myth Updater, directly on your Phone. Download the ROM from their XDA thread link. While installing this ROM you can select the launcher you want to use i.e Holo Launcher, MIUI Launcher or Stock ROM default Launcher. You can also select File explorers such as MIUI file explorer, Solid File explorer or just stick with the default file explorer. This ROM is stock based with far more features than other stock based ROMs. You can Overclock Galaxy ACE with this custom ROM. Toggled status bar is of real help if you need to operate faster. I was kind of expecting more from this ROM. It is no doubt good but the features included could have been more, like I always miss the extended power menu. Use it only if you like seeing the video Preview. 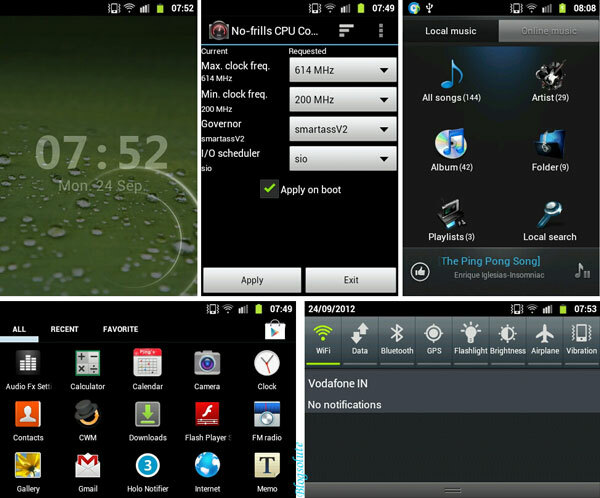 Based on CynogenMod 7.2, this ROM is smooth and fast. There are no unnecessary apps and also the Google apps like gtalk is not present. So all you have to do is flash them separately. The default SMS app is also missing, use Go sms instead of that. There are no file explorers by default, so you need to download one From the Market. You will need to download a music and Camera app too. All other things are working fine. I have used this ROM for a long time and it is really good on battery life. In this ROM you get only what you want to get, simple logic. 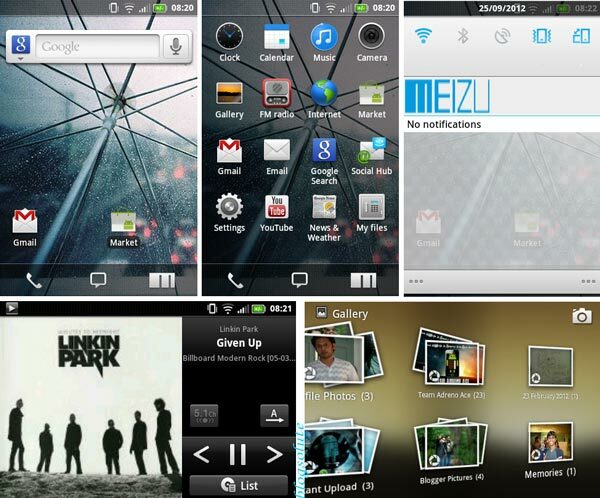 For additional ICS Layouts, follow the guide in XDA ROM Thread. Download This ROM from XDA. This rom is like Xperiatized rom and from the same developer. The only difference is it’s based on CynogenMod. This rom is smooth and really looks good. With present version 2 I am having problem like softkey light turning on automatically. You will also have TimeScape app but its resized to our resolution, hence the texts are bit broken. Based On CynogenMod 9, this ROM is still in beta stage but in one word, it’s awesome and smooth. I am presently using it and it does freezes some times. I have not used the camera much though. Do not use it if you want totally stable ROM and do not plan next flashing for long time. Do check the XDA thread for latest updates. Its really hard to cope up with battery life when all the functionality of CM9 are active. So keep all unnecessary functions like touch tone, haptic feedback, animations, live wallpapers off. You can also try and reduce maximum processor frequency when you are working in general. Increase it again when you need to play games or watch YouTube videos. Do not reduce the minimum frequency as you will experience lags when you will unlock the phone from next time. Select a lower time for your phone to sleep and also pick lower screen timeout. Do not keep poking your phone unnecessarily as it will not allow it to sleep and hence the processor will be active. Try to keep WiFi off during sleep and if you are always keeping it on, make sure to reduce the maximum processor frequency. I am doing the same and I get 1 day backup with 1-2 hours talk time, no music and YouTube. WHICH IS THE BEST CFW FOR XPERIA-U? No idea, I am having Galaxy Ace. So you can search it on XDA. need to know about galay y gt5360 rom. I m using Gingericecream ROM for Galaxy ACE. fast, stable and animated. 2.3.7 is best for ACE. Well, Thats y I included Apocalypse. Its CM 7.2 barebones with OC Kernel. I was stressing on long battery with more free space. No. It will brick ur phone. Depends on what base you want. If you are looking for a good looking rom, go for Sense 6. Apocalypse Rom for CM 7.2 base( you need to flash google services separately). is there is one of the updates supports Arabic langues ? No, its only for GT S5830. i have installed pac rom on my galaxy ace(nims11), is there any way to revert back to stock rom 2.3.6? can i install apocalypse rom on pac rom base? which roms can i furthur install on pac rom which i have installed now?? What about Jellaxy? It aint good? hola amigos pueden hacer compatible la rom ”Sony HD ROM”para el samsung galaxy pocket plus s5301l?